thank you very much for visiting my website. My name is Susan Tong. I am a professional real estate agent in Singapore. I specialise in sales of condominiums and landed properties in prime districts and Sentosa Cove. 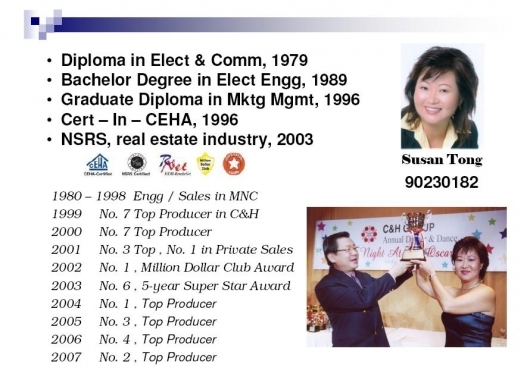 I am one of the TOP PRODUCERS from 1999 to 2007 in one of the big 4 real estate agencies in Singapore. I am a member of SAEA, short for Singapore Accreditied Estate Agents. I have more than 10 years of experience in buying, selling as well as in investing in Singapore Properties, and I can help you to choose the "right" property in Singapore - whether you are an experienced investor, a first time buyer or a foreigner looking to move into Singapore. My services take you through the whole process - finding the right property, negotiating the best price, making an offer and closing the deal. My after-sales services include property management, ie. to manage your property after leasing it out for you, while you are living oversea. I provide you with regular updates of your property as well as the local property market via weekly email or sms. This gives you a peace of mind. I also arranged for lawyers for your conveyancing matters and reputable bank loan officers to handle your loan financing with no extra charge on you at all. Hence be it condo sub-sale, direct purchase of new projects or purchase from secondary market for the low, mid to high-end market, please do call me for a non-obligatory discussions. Trust that you are dealing with someone professional, highly competent and committed. Hope to hear from you soon regarding your real estate needs. Here is a summary of my credentials and track record. Thank you.